Delivering an unforgettable tasting experience, this cuvee is a reflection of the close cooperation between Carol Duval-Leroy, President of the House, and Sandrine Logette-Jardin, her Head Winemaker. Both are women of a passionate and generous but demanding character, and their personalities are fully expressed in the preparation of this exceptional wine. Through its fine and delicate structure, Femme de Champagne Vintage 2004 presents a wine of exceptional finesse and aromatic complexity. At once smooth, rounded and silky, and in appearance like mother-of-pearl, Femme de Champagne 2004 reflects the elegance and the refinement sought by Maison Duval-Leroy for an unforgettable tasting experience. 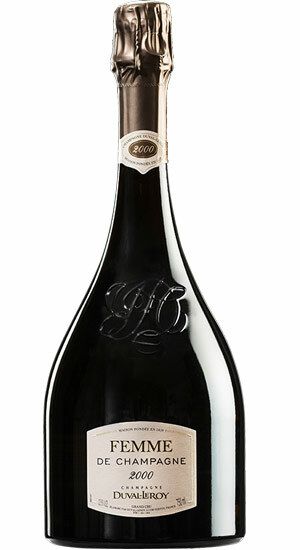 Femme de Champagne is the result of a delicate marriage of the best parcels of grapes from the region. Fine bubbles gush through the wine, bright with hints of the yellows and greens of springtime, and lit up with the sparkle of silvery moonbeams. On the palate, a bewitching flavour of ripe hazelnuts surrounds the floral fragrance of honeysuckle, followed quickly by the delicate notes of crystalized mandarin orange peel.